stock here: Wow, kind of amazed this has never been on anyone's radar so to speak. The B-52 was carrying four hydrogen bombs more powerful than those dropped on Hiroshima and Nagasaki. Two were recovered intact from the sea but the others leaked radiation into the surrounding countryside when their plutonium-filled detonators went off, strewing 3kg of highly radioactive plutonium 239 around Palomares. Secretary Kerry just signed a deal with Spain to bring plutonium contaminated soil and waste from Spain to the US. The contamination in Spain resulted from a US B52 bomber colliding during refueling in 1966 and dropping four nuclear bombs on Spain. The bombs did not detonate, but the plutonium waste is still widespread. It is past time to abolish nuclear weapons worldwide. 116 countries have already signed the pledge. 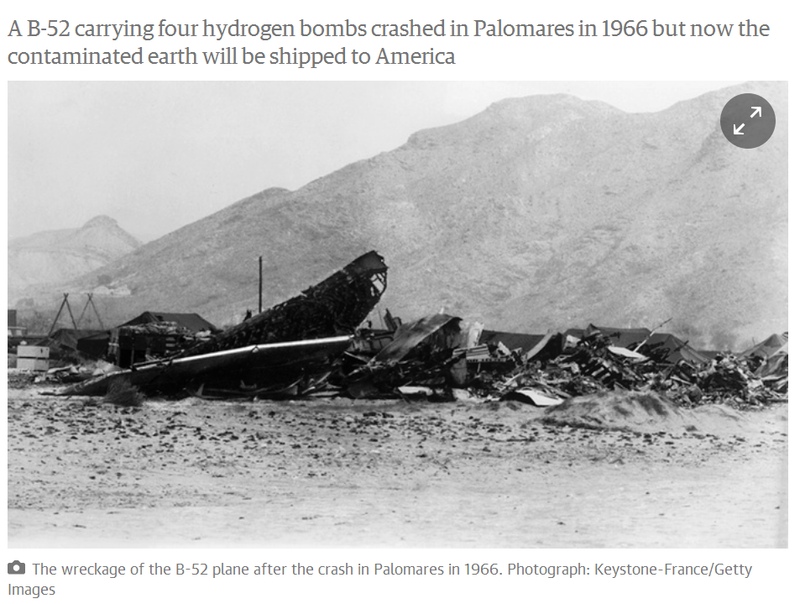 The Palomares clean-up deal is seen by many as a sweetener in exchange for Spain agreeing to Washington ramping up its military presence in the country. The number of marine personnel at the base in Morón in southern Spain is to be increased from 850 to 2,200, and to 3,000 in the event of a crisis. There were 2 crashes actually, and just 2 years apart. In each case the local population participated in the cleanup, but had no protective gear and were not told about the risks. US military knew of the risks, and just "pretended" they didn't exist. A truly disgusting example of the cold war and cold sociopaths running our country. Real story in link below. Haven't you heard of the term "Broken Arrow"? Frankly im surprised you are making hay over this as its been known for quite some time. No public health threat here. NO threat, but spend $110M on the cleanup, then why do it? You realize if all rational governments abolish nuclear weapons then its only the irrational that will have them. How do you think we keep the Irans, Iraqs, North Koreas of the world in check? Its the lack of cleanup. Not the fact that we have nuclear weapons. But the cold war insanity of keeping planes with nukes bombs in the air CONTINUOUSLY during the 60's was just asking for an accident. So could you identify which, among governments which have the nuclear weapons, qualify in your mind as rational. And while you're at it, perhaps you could clarify your position by defining your use of the word 'rational' for us. Just curious.